One Chunky bracelet footprint charm (which is twice the weight and thickness of a Classic bracelet footprint charm) attached to a chunkier 7.5 inch T-Bar and ring sterling silver bracelet. What shape bracelet charm can I have? One Chunky bracelet footprint charm (which is twice the weight and thickness of a Classic bracelet footprint charm) attached to a chunkier 7.5 inch T-Bar and ring sterling silver bracelet. 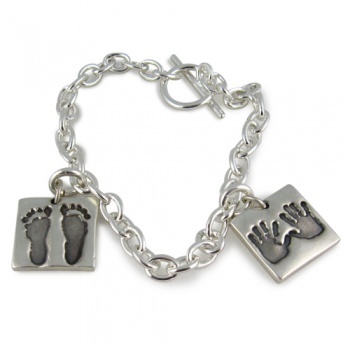 A single handprint or footprint shows the best detail but 2 prints or a print with name or initials written in a choice of 3 writing styles can sometimes fit on the charm depending on its shape. The name can be engraved on the back of chunky charms.